All of us love Linux distributions isn’t it? Some love Fedora, some the love Ubuntu or some geeky like me to love Arch. Its all fine, as long as you are satisfied with your distribution and think that its awesome. Now what if you want to build your own distribution? Lovely work, isn’t it? But also tough, as all you have to do is to make Linux From Scratch. 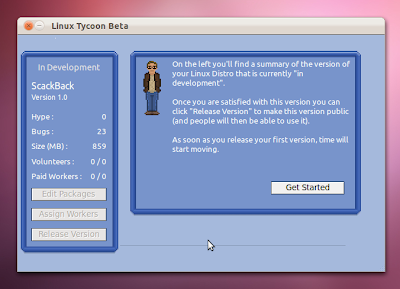 Thankfully, here comes a game that will help you build a Linux Operating System you want, atleast in fantasy. 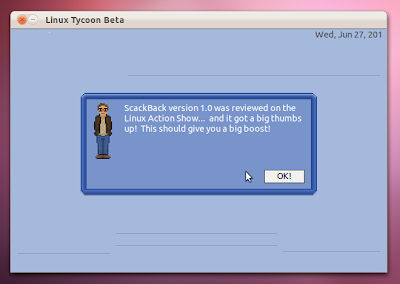 Linux Tycoon is a Linux Distro Stimulation Game, that was launched on April 2nd, and we have got a sneak peak of it, exclusively for our readers.We got a review copy of Linux Tycoon from its author Bryan Lunduke yesterday and to say the truth, I was glued at it whole day and so had to postpone the review of it today. The game is DRM free, available for Linux, Mac OS, Windows and comes at a size of less than 2 mB. Yes you guessed right. Great things come in small packages. 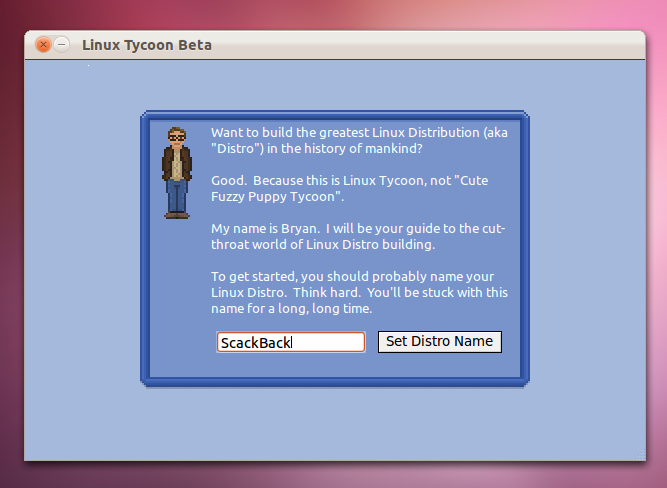 When you start the game, you are greeted with the following screen where you have to give your distro a name. In the scheduled version hopefully coming out soon, you will also be able to give it a logo and background image. Next you will have to select software packages for your system which seem to have some some funny but familiar names (such as QDE, ShmoogleShrome). 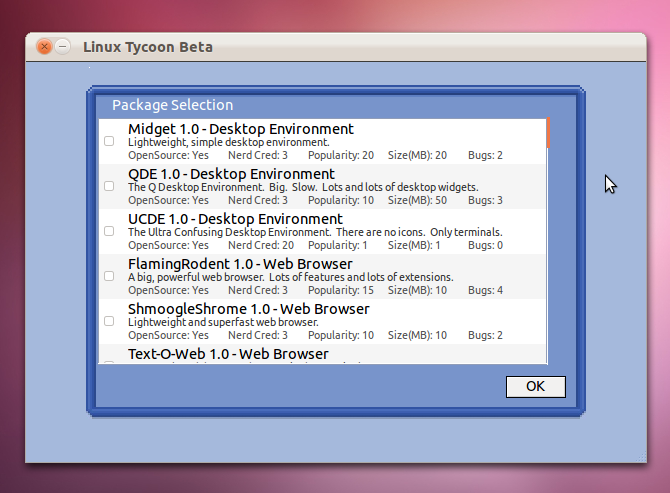 Bryan has promised us to give us the ability to create custom packages in Beta 2, so we have some great things coming up! Each package has some parameters which determine your performance in the game. This include Open Source, Nerd Creed, Popularity and Bugs. While using more popular software may result in a increase in user base, usage of closed source software will let someone declare your distro “negative in freedom sense” and will generate a minus hype. As your user base increases, you will get some volunteers and paid staff (the later more competent) which you can assign to fix bugs in the software. Surprisingly, you can assign people to fix bugs in closed source software too! After a few intervals of time, you will have to release a newer version of your distro, else people will start looking somewhere else and you will lose users. Each time you release a version, it will be reviewed by The Linux Magazine and The Linux Action Show, which may either give you a thumbs up resulting in more users, or compare you with “Stincy Chinese” resulting in negative hype. The more positive hype you get, the more users will switch to your distro, making you reach nearer to your ultimate goal, to build the best Linux distro ever with the largest user base. 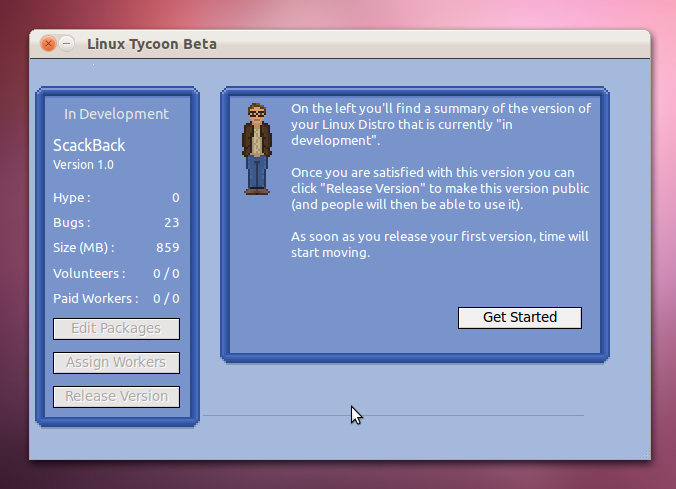 The game is quite addictive, and my love for other tycoon games further enhances it. However, like other turn based games, it tends to be quite boring as you seem to the same things again and again. Look wise, there is nothing so attractive, but to say, you don’t need it to be attractive. It takes a quite of bit of time to reach the top ten distro list, and much more to reach in top three, so make sure you have no work otherwise you will probably waste a few hours addictively playing it. Over all, I liked the game. 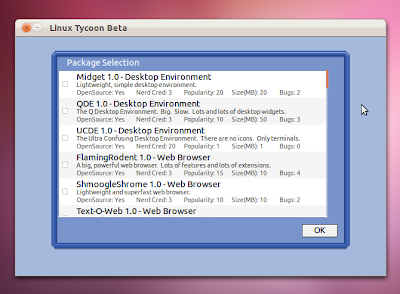 It makes me realise the efforts put on the distro to make it usable, and make it admire it. More than that, I admire the developer of the game more to come up with such ideas and games, which are rare in Linux. The game comes with a price tag of $4, which is low and incomparable to the idea and efforts put behind it by a single developer. Buy it, you will surely have a few hours of fun gameplay. Also as Bryan mentions – “People who buy the Beta will definitely NOT need to buy again when it’s out of Beta”, so definitely its worth a buy. Some quick tips : Concentrate on more popular packages first. Once done, concentrate on packages that have a better nerd creed. Pros: Addictive and fun gameplay for hours. Cons: No pause button. Tends to become boring after sometime.